This spring buying season is off to a strong start—in fact, prices are going up faster than they were just a few months ago, according to nearly every recent metric. So does that mean we’re in a bubble? Nope, that’s just what happens when demand increases faster than supply. After all, existing-home sales were up 9% year over year in March, according to the National Association of Realtors®. Inventory is also increasing, but not as fast as sales, resulting in a tight supply getting even tighter. An equilibrium level of supply on the market is considered to be six to seven months; supply has been under five months since December. Looking at every quarter since 1988, when supply was under five months, prices rose 8% year over year on average. When supply was in the equilibrium range, prices went up only 4% on average. The median existing home price in March was $212,100, up 8% over last year, according to the NAR. The median list price in March on realtor.com® was $220,000, which was up 11% over last year. During the peak years of the housing bubble, from 2003 to 2005, the data on supply versus price appreciation looked very similar to what we are seeing now. But there are key differences, which is why I’m confident that on the national level, this is no bubble. Read the rest of this article at Realtor.com to see why, this time, the price increases should stick . As chief economist of realtor.com®, Jonathan Smoke leads its efforts to develop and translate real estate data and trends into accurate and relevant consumer and industry insights on housing. The Stowe, VT real-estate market began 2015 as a strong and stable market. While sales were down slightly compared to Q1 2014, the increase in activity, showings, offers, and contracts signed by the end of Q1 2015 is pointing to a year of potential growth. The real-estate in the rest of Lamoille County, excluding Stowe, saw some contraction this quarter, but is expected to move into positive territory with the arrival of warmer weather. Finally, the Waterbury market was not only stable in Q1, but this market is gaining in all significant categories. 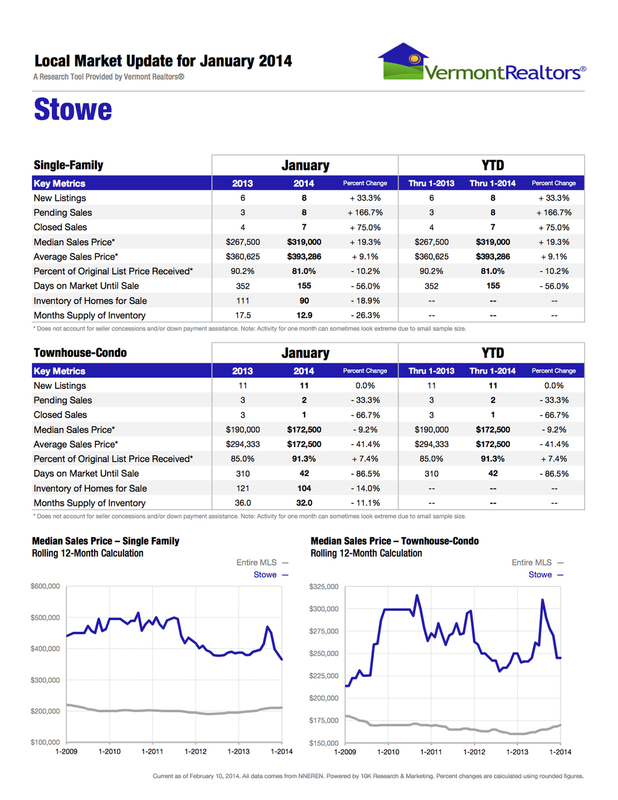 Click here to see the complete Q1 2015 reports for Stowe VT, Lamoille County, and Waterbury VT.
Interest rates are as low as we’ve seen in a long time (3.75% for a 30-year fixed, at the time of this publication), and a local mortgage broker has recently indicated that his portfolio of loans to close in the first quarter of 2015, is the largest he’s seen in the past 5-6 years. Read the complete year-end report here with additional data for Lamoille County and Waterbury. Signs of spring in Vermont are finally beginning to emerge after a very cold and snowy winter. With the transition from from winter to Spring getting a late start this year, some are still skiing the back country, while die hard mountain- and road-bikers have already begun prepping their bikes for a late spring start in the woods and on local roads and byways. Trees and flowers will soon begin to blossom, just as the real-estate market will. Sales have been robust this winter, and projections indicate continued growth. Vibrancy continues in Stowe village as well, with Plate, our newest restaurant having recently opened to rave reviews. Q1 2014 has shown another marked increase in residential sales compared to Q1 2013, with home sales up 60%. That is the most significant increase we’ve seen since 2010, when it was approximately 27%. Consumer confidence continues to strengthen, buyer demand is strong, interest rates are still low and stable, and an area-wide decline in inventory have all combined to create a vigorous market and strong start to the new year. Residential inventory is down 11%, which is a 10-month supply and is 44% lower than Q1 2013. In contrast, the Q1 2014 median and average residential sales prices soared 71% and 41%, respectively. Inventory is down, closing prices are up slightly, at 1.1%, and median prices are down both for March and YTD. The percent of original price received is up 9% in March and 9.6% YTD. If you've been wanting to buy, the time is still right! New listings and closed sales are growing, and closing prices are up, indicating a shift towards more expensive homes. Median and Average sales prices are both up significantly; and, homes are selling more quickly (by 25%) than they did a year ago. But inventory, overall, is decreasing, with months supply down to 11.2, down from 19.3 at the end of March 2013. The net? There's a bit of buying frenzy going on. If you're planning to buy a single-family home in Stowe, you should think about starting your search soon. Read the complete report, with stats for Stowe and Lamoille County. Inventory is down, closing prices are up. Interest rates are working their way up. If you've been wanting to buy, the time is right! Inventory is down, closing prices are down minimally, and interest rates are working their way up. If you've been waiting to buy a single-family home in Stowe, don't delay too much longer. Read the recently released February existing-home sales report from the National Association of Realtors, which is consistent with our Stowe-area statistics, without the weather's negative impact on activity as it is in much of the rest of the country. The same factors that catalyzed widespread market recovery in 2012 and 2013 are likely to continue in 2014, though perhaps at a more moderate pace. That’s not a bad thing, since the market is returning to a stable, healthy state. Potential trends to watch for in 2014 include increased seller activity, more new construction and fewer foreclosures on the market. Inventory is another metric to watch this year. Read the complete report, with stats for Lamoille County and Stowe, here. November was largely another encouraging month for residential real estate. Our attention has shifted from multi-year high prices and sales volumes to seller activity, inventory levels and building permits. And let’s not forget the calendar effect. As families gather together, fewer house hunters are scheduling showings and writing offers. Watch for month-to-month activity to moderate while year-over-year comparisons remain strong. The 2011 Market Data statistics for the 4th Quarter 2011, and for the entire year, are still in the works However, the first one I'm delighted to share with you, shows that the Coldwell Banker brand is the 2011 Vermont Sales Volume Leader. See the chart here.